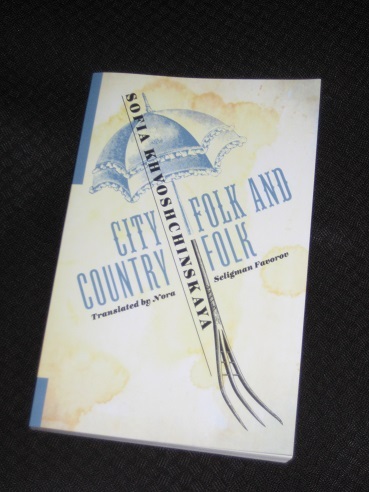 Sofia Khvoshchinskaya’s City Folk and Country Folk (translated by Nora Seligmann Favorov, review copy courtesy of the publisher and the Australian distributor Footprint Books) takes the reader back to the Russian provinces at the start of the 1860s, at the time of the emancipation of the serfs. Middle-aged widow Nastasya Ivanovna Chulkova is living on a fair-sized estate with her seventeen-year-old daughter, Olga Nikolayevna (Olenka), and a number of domestic staff. The problem of how to handle her fifty newly-freed ‘souls’ is a constant worry, but this fades into the background when she receives an unexpected visitor, one who is to throw the household into turmoil. City Folk and Country Folk is a short novel focusing on a handful of major characters, with its strength coming from a series of explosive confrontations between them. Poor Nastasya Ivanovna, a woman with a preference for a quiet life, is forced into situations she’d much rather avoid as a result of her unwelcome visitors. Interestingly, though, she rises to the challenge, something which is hinted at on the first page when the writer talks of the enlightenment this summer is to bring her. Certainly, the woman who descends into the servants’ quarters to quell a looming rebellion is almost unrecognisable from the timid character who can’t bring herself to throw her parasitical relative out. But whatever society Ovcharov appeared in throughout his wandering life, he was never anything more than a fine fellow. Nowhere did he leave a strong impression: he was easily liked and easily forgotten. With women, in love and hate, he played only an incidental role; among serious people his presence brought on a slight sense of boredom; and through his entire life he had failed to attract a single devoted friend. Despite this, in the country he regards himself as a man without equal, free to act as he chooses, and his patronising manner towards Nastasya Ivanovna isn’t exactly guaranteed to endear him to the reader. Ovcharov threw himself at her and, before she was able to say a word, kissed her neck and shoulders. Apparently Olenka really was stronger than he. She grabbed him by the shoulders and shoved him to the other end of the carriage, quickly and without making noise or uttering a sound, so that the coachman did not even turn around. That’s not the only comparison you could make with British nineteenth-century fiction. City Folk and Country Folk delights in slightly sarcastic sketches of its protagonists, from Ovcharov to the penny-pinching Katerina Petrovna Repekhova-Dolgovskaya (a woman who has a vested interest in forcing Olenka into an unwanted marriage) and even the local priest, who tries to avoid giving sermons so as not to upset people. Kvoshchinskaya is also expert at creating memorable scenes, with the confrontation in the carriage just one of many excellent passages building up to a final confrontation in which the invading city forces finally realise that their cosmopolitan privileges count for little out in the country. There’s a lot to like about the novel, but I do have some reservations. While the major scenes are wonderful, the story can drag a little in between, with large amounts of exposition for such a short novel. The comparisons with Austen aren’t always apt as there were passages here where I was tempted to skim a little, and it took a while for the story to really get going. In truth, it’s a work where the parts between the confrontations are mainly there to get us to those scenes, and you sense that the book is caught a little between being a taut, focused novella and developing into a longer, more psychological novel. Akyline – Completely deliberate Soviet rewriting of history according to the introduction! I do love Russian novels and have read so few by women. Sometimes the new translations are a bit clumsy, though, and I am not heartened by the quotation with grabbing and shoving!